"Muskrat" is kind of a terrible codename, but when you learn that the toy's other options included Mossback, Swamp-Runner, Bayou, Bad-Bayou, Gumbo, Swamp Dawg, and even Wet Willy, suddenly it doesn't seem so bad. Muskrat spent his formative years up to his knees in one Louisiana swamp or another, hunting raccoon, opossum [sic] and wild pig. He was able to hold his own against poachers, 'gator skinners, moonshiners, escapees from chain gangs, and smugglers. Army Ranger school and JWTC (Jungle Warfare Training Center) seemed like summer camp to him. 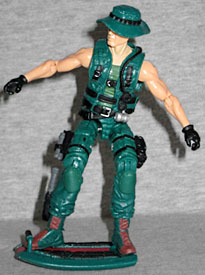 When he was tapped for the GI Joe team, he was sent to advanced warfare school. By the time he graduated, he was teaching the experts a thing or two about swamp fighting! Muskrat is adept at crossing swamps rapidly on his swamp skimmer board. His tactical floatation device is strong enough to dissuade snakes and aligators, or wield as a balistic shield to deflect arms fire. It can be used offensively to silently knock an enemy combatant unconscious, or exfiltrate a captured agent or freed prisoner unable to navigate the terrain as swiftly as himself. Once again, this figure's head was originally designed for the Operation Nocturnal Fire box set, so it's never been used by anyone other than Mr. Ross Williams, here. But really, "why?" 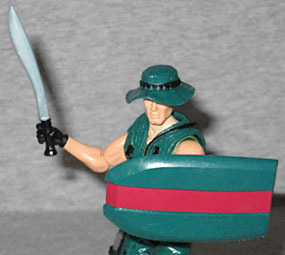 His boonie hat is removable, and there's nothing special about his face (glasses, beard, etc. ), so go to all the trouble of making this instead of reusing a random Duke? I mean, he's already got Duke arms - PoC Duke, since he had bare arms without being a giant, but Quick Kick arms would have served the same purpose without being as overused. It's not even like they have the excuse of extra wrist joints in the forearms or anything. He gets Alpine's torso, though you may not recognize it beneath the Lamprey vest. His legs are from the world's best Snake-Eyes, as easily recognized by the big removable kneepads. The Night Force Muskrat was wearing black and had blue highlights - this one is back in his traditional green. The toes of his boots as well as the laces are brown, and all the various straps and pouches are black. He's also wearing black gloves, because you don't want to leave fingerprints when you're breaking into the swamp. Naturally, his articulation is all up to snuff, in case you want him to whirl and to twirl and to tango: he moves at the ankles, knees, hips, torso, wrists, elbows, shoulders, and neck. Of course, it's just plain swivels at the wrists, not swivel/hinges. 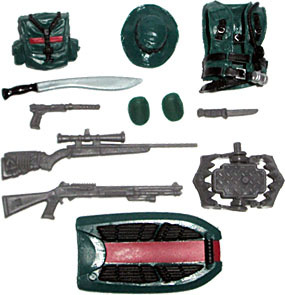 In addition to the removable hat and vest, and the knife, pistol and silencer that go along with the Snake-Eyes legs, he's also armed with a machete, shotgun, a sniper rifle with bullets on the stock, and a bear trap. He has a blocky backpack with a Y-shaped strap, and of course, his "tactical floatation device" - aka, a boogie board. 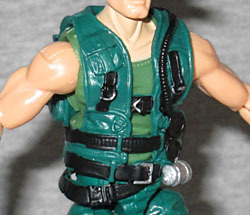 On the 1988 original, there was a backpack peg in the middle so he could carry it around that way - for this figure, there's a handle at the front, allowing it to be used as a shield. After all, nothing provides 100% guaranteed protection from bullets like something that's also light enough to float on water. That's why all America's soldiers are issued Nerf body armor. Muskrat isn't an overly exciting figure - but then, if the Figure Subscription Service releases are going to stick to Generation 1 characters, there really aren't that many interesting options left. At this rate, Year 4 is going to start with Colonel Courage and and end with the A River Runs Through It version of Bazooka. By that metric, the weird swamp-man is just strange enough to be cool.